I started on the real practice kit today. First, you have to make the stiffeners. Easy as pie, except the stock I got in my kit was cut short by about 1/2″ in each case. I got two shorter sections, the kit shows it comes as one long piece. Maybe George gave me some extra that was laying around. 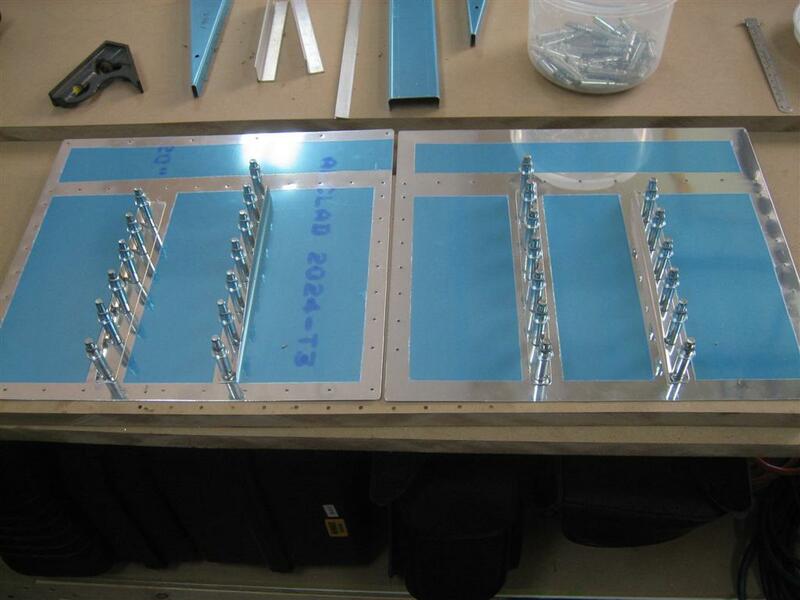 No biggie, but that’s why in the pictures below the stiffeners are different lengths. Then I edge prepped the stiffeners, ribs, spar, and skins. I also practiced using the soldering iron some more, with pretty decent results. 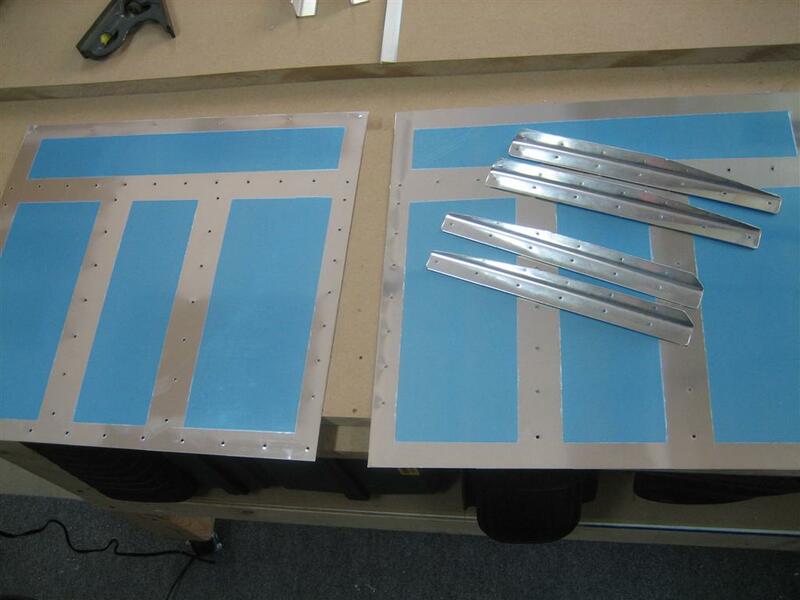 Here’s a shot of the stiffeners and skins ready to match-drill. Skins and stiffeners ready for match-drilling. After this, I assembled the skeleton, matchrilled both skins to the ribs, spar, and trailing edge wedge, then disassembled everything. It got late, so I stopped after getting all the holes deburred. 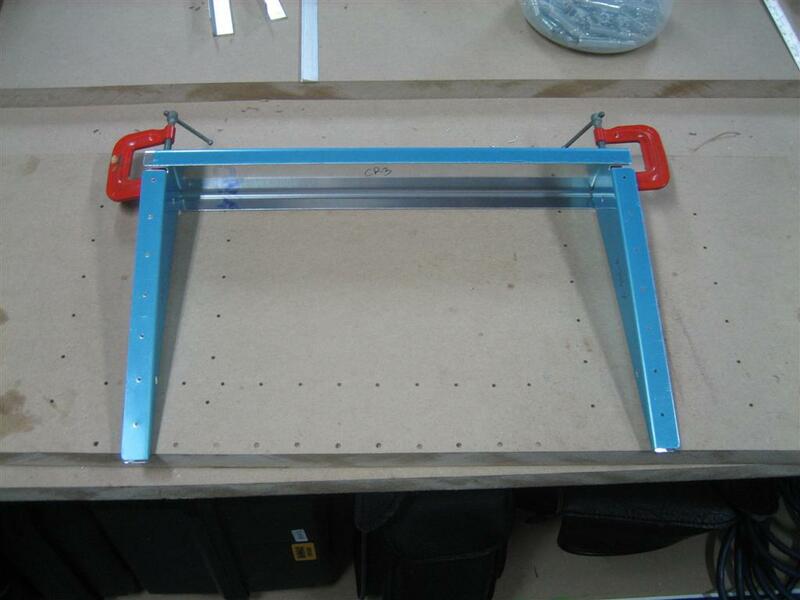 Here’s a shot of the skeleton clamped together, ready for drilling. Next step is to figure out a priming process and test it out before dimpling and riveting. This entry was posted on Wednesday, September 30th, 2009 at 2:08 pm and is filed under Practice Kit. You can follow any responses to this entry through the RSS 2.0 feed. You can leave a response, or trackback from your own site. Did you use a squeezer at all to complete this? I believe for the trailing edges of those ribs, I ended up countersinking, even though that is NOT an approved method back there. For the real kit, I ended up buying Avery’s Pop-rivet dimplers (http://www.averytools.com/pc-857-72-pop-rivet-dimplers.aspx). Also, on the plans of the practice kit, I think there is a drawing of a piece of steel with a hole and countersink cut into it. You can slide this side on the underside, and use your male dimple die (or a rivet with your gun) to created the dimple. For the record, I love my hand squeezer. I use it anytime I can.